Whenever I get the chance to speak with an artist I love, I say yes. 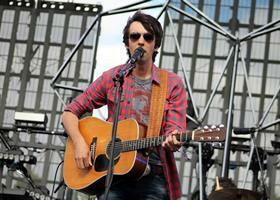 At this year's CMA Fest, I was given the opportunity to once again speak with country artist Mo Pitney. Pitney has had a very busy schedule since our first conversation a little over a year ago. Recently becoming a dad, Pitney has found new inspiration in his beautiful daughter Eveline Nadine and his stunning young wife Emily. We spoke about their recent performance at the Nashville Palace, along with having family join him on the road. Guess which one of his family members provides the snacks? Watch our full video to find out. While talking with Pitney, you cannot help but feel calm and loved. His gentle and soothing voice brought me peace. Listening to him speak about his love for God and sharing my love for God with him was magical. Pitney is a very passionate artist who is not afraid of being himself. Though he has learned some lessons along the way, he has shown us that with God by our side, we can get through anything. Having a real conversation with Pitney was the perfect way to start off day one at CMA Fest. With the stress of travelling and checking in on time for my first interview, Pitney's message was exactly what I needed to hear. He left me feeling at ease and free from the stress of the early morning. I could have talked with this genuine artist all day. Pitney is one artist that will always stand out to me as one of the best talents of our time. His voice alone is addicting. His writing skills are beyond amazing. They inspire, create hope, fill your heart and soul, and entertain everyone who listens. My current favorite song is "Everywhere". This song will have you singing along in no time.